Comet Lovejoy plunged through the sun’s corona at about 7 p.m. EST today (midnight GMT on Dec. 16), coming within 87,000 miles (140,000 kilometers) of our star’s surface. Temperatures in the corona can reach 2 million degrees Fahrenheit (1.1 million degrees Celsius), so most researchers expected the icy wanderer to be completely destroyed.But Lovejoy proved to be made of tough stuff. A video taken by NASA’s Solar Dynamics Observatory (SDO) spacecraft showed the icy object emerging from behind the sun and zipping back off into space. “Breaking News! Lovejoy lives! The comet Lovejoy has survived its journey around the sun to reemerge on the other side,” SDO researchers tweeted today. 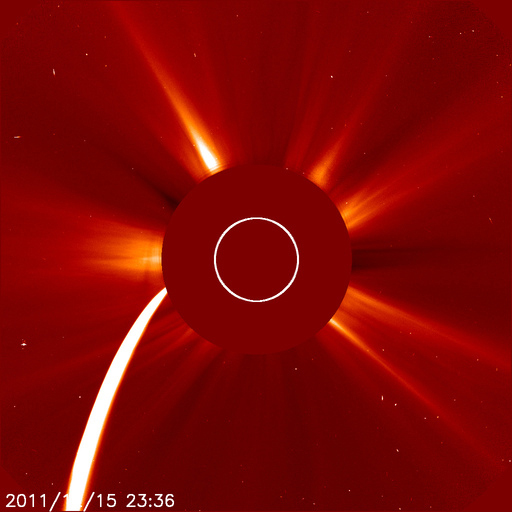 SDO is one of many instruments that scientists — eager to record and study the comet’s presumed demise — trained on Lovejoy as it streaked toward the sun.